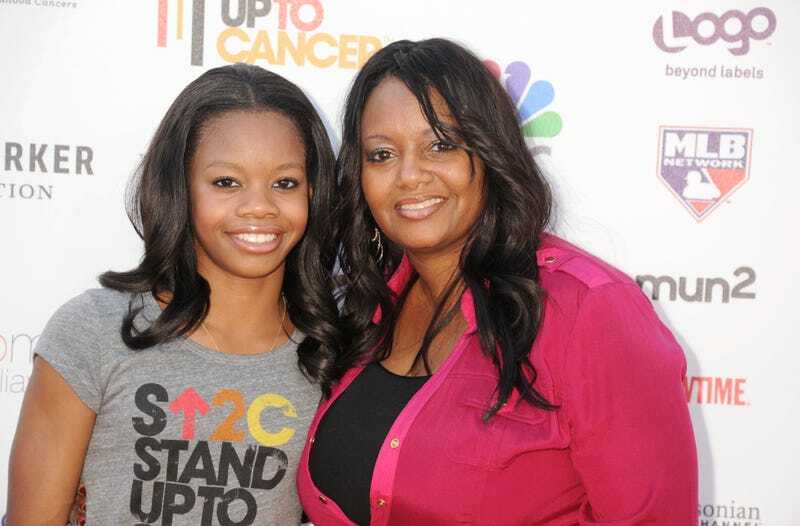 Gymnast Gabby Douglas and her mother, Natalie Hawkins, arrive at a Stand Up to Cancer event in Los Angeles Sept. 7, 2012. It seems as though there are certain aspects of Gabby Douglas that people love to criticize, and the mother of the two-time Olympian is fed up with it. Natalie Hawkins, Douglas' mom, is now speaking out about the bullying her daughter receives online during the biggest moments in her life. "She's had to deal with people criticizing her hair, or people accusing her of bleaching her skin. They said she had breast enhancements, they said she wasn't smiling enough, she's unpatriotic. Then it went to not supporting your teammates. Now you're 'Crabby Gabby,’” Hawkins said in an interview with Reuters. "You name it, and she got trampled. What did she ever do to anyone?" Hawkins said. Last week Douglas was criticized over the state of her hair, as well as for not placing her hand over her heart during "The Star-Spangled Banner." "I don't think respecting your country or your flag boils down to whether you put your hand over your heart or not," Hawkins said. "We grew up in the military community. My mom spent almost 30 years in the military, my dad's a two-time Vietnam vet. Because of that, it was so insulting that they would accuse my daughter of being unpatriotic when we are so tied to the military family. "When 'The Star-Spangled Banner' is played, most military members either salute or stand to attention," she said. Hawkins went on to say that both she and Douglas have cried about the bullying, to the point where her daughter has had enough. "What was going through her head was, 'I'm being attacked for everything I do, so I might as well not do anything. Because no matter what I do, I am being attacked,’” Hawkins said. On Sunday, after not medaling in the individual competition, Douglas spoke about how it feels to be ridiculed. Douglas also spoke about what she would have done differently this Olympics. “Everything I’ve gone through has been a lot this time around,” Douglas said, “and I apologize if [I seemed] really mad in the stands. I wasn’t. I was supporting [teammate] Aly [Raisman]. And I always will support them and respect them in everything they do. I never want anyone to take it as I was jealous or I wanted attention. Never. I support them, and I’m sorry that I wasn’t showing it. In a time when the country should be cheering on Douglas, it's a shame that her mother even has to address these issues. And it's even more of a shame that Douglas is one of the top gymnasts in the world but is still subjected to ridicule.